Making card payments requires a centralised system. The card payment system in Estonia is managed by Nets Estonia AS. The system allows the cross-usage of bank cards, so a card from one bank can be used at a merchant who is a client of another bank. This means the merchant only needs a payment terminal from their own bank, and they can accept payments with cards from different banks. 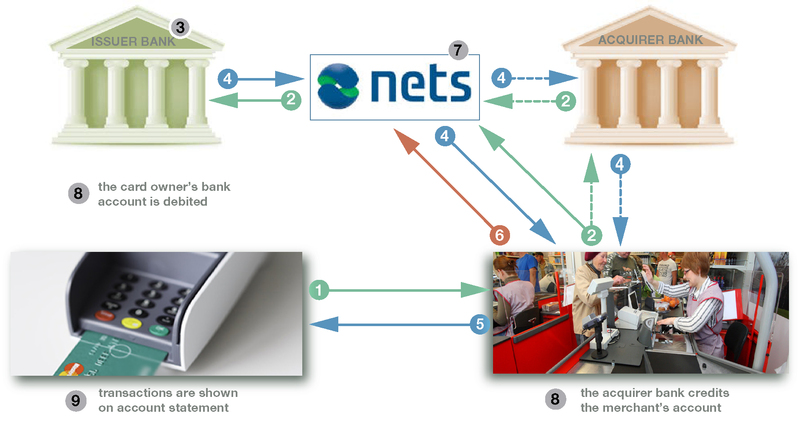 A particular feature of this system is that the rules in the agreement between Nets Estonia AS and the system participants make Nets Estonia responsible for authorising and processing the card transactions and the banks using the system responsible for settling the transactions by meeting their financial obligations to one another. This means the Estonian card payment system is a joint-use system (see the illustration of card payment infrastructure). As well as managing the domestic card payment system, Nets Estonia provides the connections to international card organisations like VISA, MasterCard and American Express that are needed for card transactions. Another system for the card payments of local banks alongside that of Nets Estonia is managed by Worldline Latvija, which manages the ATMs of some banks operating in Estonia. The card payment system processes card transactions around the clock, 24 hours a day and 7 days a week. The system gathers the transactions together, processes them, and sends clearing information to the banks and the international payment networks. The liabilities banks have to each other as a result of the processing of card transactions in the card payment system are settled in the interbank payment systems. If a card payment is made using a card issued by one bank, and it has to reach the recipient in another bank, the STEP2 interbank payment system is used. The scheme below shows the debit card payment process and what the participants do. A card owner initiates payment by inserting the card in the payment terminal of the merchant and entering the PIN. The card payment system sends the authorisation request from the payment terminal to the issuer bank The exception is when card payments are made where Swedbank is the bank of both the person making the card payment and the merchant receiving the money. If a Swedbank card is used in a Swedbank POS terminal, the transaction is not processed by the card payment system but is settled as an internal transfer. A payment terminal may be connected to the card system directly or through the acquirer bank, and the request is sent accordingly. With international cards, the card payment system sends the request to the corresponding international card organisation. During the authorisation the issuer bank verifies the PIN entered by the payer, makes sure there are sufficient funds on the payer’s account and that the payment is within the daily limits, and confirms the validity of the card and other data. If all verifications are successful, the issuer bank reserves the corresponding amount in the payer’s account pending authorisation. The amount paid for the purchase is actually debited from the payer’s bank account within one to ten days. Confirmation of the success of the card transaction appears on the screen of the payment terminal. The payment terminal provides a receipt as confirmation of the transaction. If the authorisation was unsuccessful, if there were not sufficient funds on the payer’s account for example, the card payment is not made. A receipt is also provided if the payment is unsuccessful. An electronic list of purchase transactions is sent from the payment terminal of the merchant to the card payment system. The card payment system processes the transactions and sends information about the amounts to be paid to banks and international payment networks for clearing. The card system collects together all the transactions made with the cards of each bank and the money is moved from one bank to another in a single block. The banks balance out those amounts between themselves. The banks make the final settlements for card transactions through an interbank settlement system. The merchant’s bank credits the merchant’s account using the data processed by the card payment system. It is up to the issuer bank to debit the card owner’s account for the card payment. Transactions are shown on the account statement of the card owner.